Are there any desires harboring in your heart? Fear of failure prevents us from even attempting to accomplish some desires. Some great halal desires are left buried in our heart. Let me share with you my secret desire. It is to memorize the entire Quran before I enter the grave. I went to masjid to accomplish my goal. I stopped going to masjid once I was pregnant. I decided to go back after delivery. Now 6 years later, I’m a still at home with 2 kids. Few months back, as I was casually browsing through messages in a WhatsApp group, my eyes fell upon a contest. Do contests excite you? Well, this made me feel butterflies in my stomach. It was an invitation to MEMORIZE SURAT AN-NOOR in about a months’ time for sisters above 18 years of age! This rekindled my desire. But, I was afraid I could never do it within time. I had been praying to Allah to make me a hafiz. I hardly did anything more to become a hafiz. This contest appeared to be an invitation just for me. I recollected, this Madanee surah LIGHT spoke about chastity, hijab and related matters; I had found it even difficult to recite it in my tajweed(recitation) classes! Casting away the fear of failure, I decided to grab this smiling opportunity. I registered for the contest. Few days later I got a message stating that – I was selected! Contest was 35 days later. 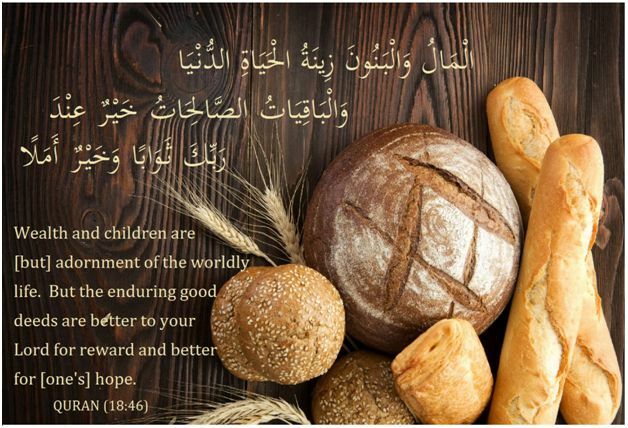 The word obligatory/enjoined/ordained made me realize the weight of the surah. 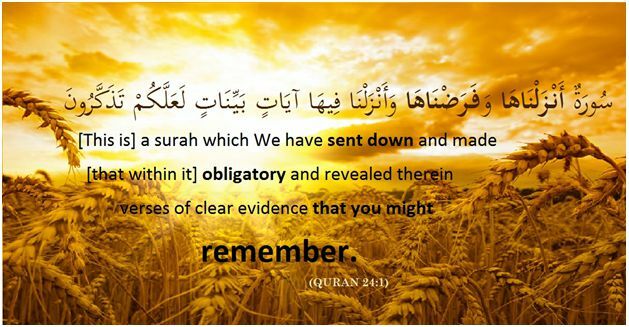 First verse also stated – “it was revealed to be remembered.” More than memorization it is important to live by the rules set by quran. Memorization could help us remember/recollect the rules better. Next few lines spoke of penalty on false accusation. By night, as I rocked my baby to sleep, I attempted to memorize. I read a first word repeatedly. Then I read two words together and so on. Within minutes I had memorized a verse! 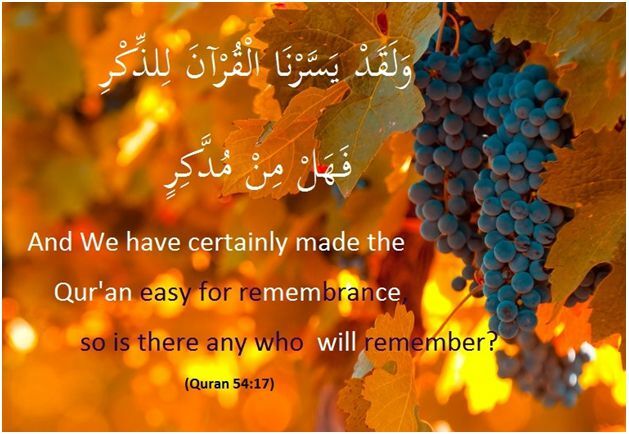 Indeed Allah has made Quran easy for us. The next day was usual. Daily chores and family had consumed all my time. By evening, memorizing noor appeared to be an impossible task for me. 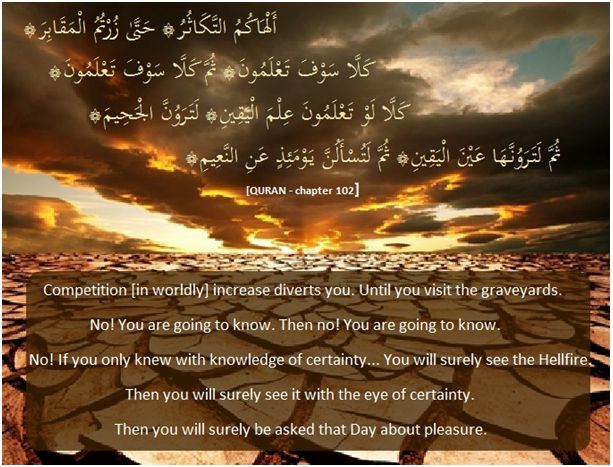 Such whispers were silenced by “Auzbillahi minash shaitan nir rajeem – I seek refuge in Allah the Shaitan the outcast.” Now with a clear head I wondered why I didn’t find time for Noor? I felt like a kid at store who had blown the cash on candies instead of bread for family! Candy is something we DESIRE but bread is our NEED/ Requirement. What was I toiling for –Family, Perfect Home, Good impression, High standards? These are the ‘candies’ of this world. The real eternal life starts after death. I had to stock good deeds (my bread) to save my eternity. It was time for me to turn wise. First I had work on my intention. It had to be strong enough to motivate. My dream, to memorize quran was in wrong category – DESIRE. I had to promote it to – MY NECESSITY / desperate NEED. I had to give Quran the first preference. There would always be 1000 excuses to stay away from quran. Such a ‘busy’ life would leave me alone in a dark grave with no hope. But just one good strong intention – “To please Allah” would make life easy and fruitful. Fix target: I decided to memorize at least a page in 3 days. By doing this, I would have 1 spare week to revise and improve. Involve family: So it was time for the whole family to connect to quran! I discussed the tafseer (explanation) of surah with my hubby. Save time: This required avoiding unnecessary calls and visits. I had to curb my addiction to solve online puzzles. Simplify chores: I settled for less complicated recipes with few ingredients. I allotted few chores to my family too. Alhamdhulilah within a week I memorized 2 pages (20 verses)! Little did I think – the contest was going to test much more than my memorization skills. It was to test my perseverance, dedication, patience, self-esteem and IMAN (faith) level too. Please read my next post to learn more about my journey. Sis you really made me cry. Indeed we are so busy in beatifying our home and our image in front of our family that we forget to beautify ourselves in front of our Allah. May Allah make this contest easy for you. Your this post is Alhamdullilah very motivating. Insha Allah, in a day or two, will post it in my blog too. This is the first time I visit your blog & i really enjoy reading your thoughtful posts. But this one… Masha’Allah!! Every word you wrote touched my heart because I feel the same right now. Since I have a baby I totally neglect my learning of The Quran & everyday I feel guilty. But your post really made me feel like “I can do it.” Barak’Allah feeki for the motivation, sister!! Alhamdhulillah. I am glad to hear from you. Your response made me cry. Love you dearly for the shake of Allah. Love you too fir the sake of Allah! I wish I had a group of sisters to motivate together to leanr the Quran.. So you post was a pearl to me! Again thank you! You could more bloggers in this association (from France too). There are other associations too. I only know this one for now. Thank you so much sister, I’m flattered.